Why You Should Choose This Tadworth Multi-Room Log Cabin. There are lots of log cabins available which tick all sort of boxes and are normally designed to meet our requirements in this modern age. However, this ‘Tadworth’ is a very special log cabin with its delightful covered veranda area The size of this area to relax in takes this building to a new level and really bring your garden and cabin together as one. The modern stylish look will stand proud in your garden and will support all sorts of socialising with your family and friends. So just imagine some of the uses for this building and you will soon realise its great virtues. This is what makes it a very special building for your family and your home. The slow-growing Nordic timber used on this ‘Tadworth’ log building ensures it’s soundly designed for long life. In Sweden, where it gets very cold in the winter, it is used throughout that beautiful country, a secret they have known about for a very long time. The sturdy design of the building with its additional supporting strips on the logs is an extra unique feature which enables these buildings to stand strong in all types of weather. The delightful modern design is enhanced with the horizontal veranda bars creating a truly stunning (and practical) building. There are not any cheap or nasty materials used in these cabins as the quality of timber used is top notch. The windows and doors on these ‘Tadworth’ garden cabins have features not normally available anywhere else. The part laminated materials add extra strength, reinforcing and stopping any potential warping or twisting effect. The new DGP+ quality windows and windows make them a joy to hang and to live with their adjustable hinges. Everything is designed for our great British weather. With the double glazed windows with proper glass (NOT plastic) as standard, they will make it a joy to be in. All timber is kiln dried and comes from renewable sources (naturally). Surprisingly some log cabin firms even use chipboard, OSB boards if sheet materials in their buildings which is totally unsuitable. As well as cheap Chinese furniture is used rather than the rather more robust DGP+ European fittings. These logical nature of these buildings helps to make it relatively easy to assemble so could be done by an average DIYer. The fact that they have been designed and tested at the factory to ensure everything works and fits together makes it a doddle for assembly. To make it even easier all parts are bar coded for ease of identification. However, if you would like your new log cabin erected for you, and on the larger buildings might be a good idea, then we can provide details of third parties who can do this for you. Assembled efficiently and quickly your new log cabin with its delightful veranda can be in use for your family before you realise it. Well worth considering? 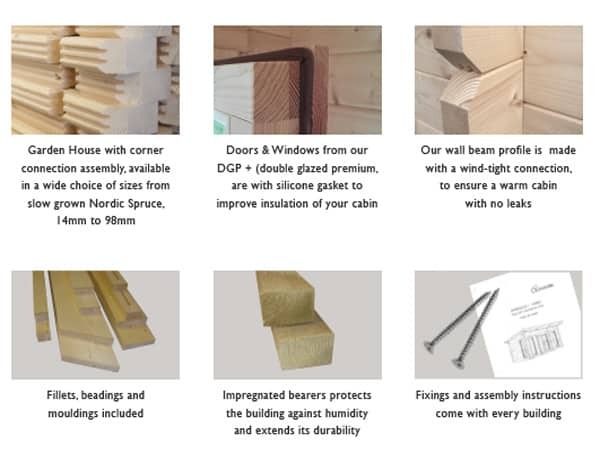 The web, whilst is a great tool for finding garden cabins it, can never show you the quality of the product being offered. This is why you should make it a prime consideration before buying or viewing cabins beforehand, if possible. Even if you are unable to view it’s still worth dealing with a company which has a log building display site. This should give you the confidence in their products as they are happy for their products to be inspected at close quarter – unlike many cabins firms selling on the web. If you can visit a display site you can make your own mind up about the quality of the building so that you know when it arrives you won’t feel let down or feel misled. 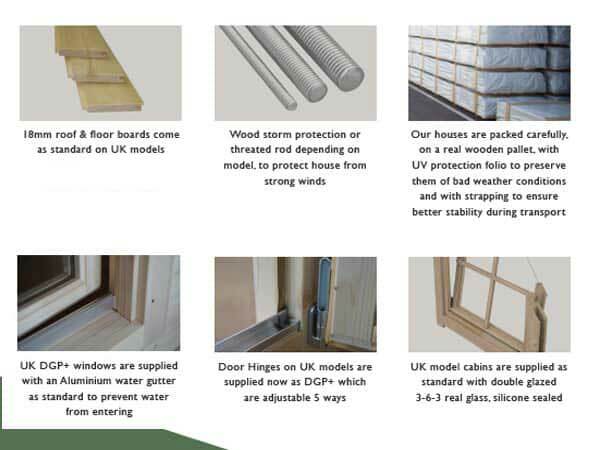 1st Choice’s background in manufacturing garden buildings, which started in 1979 BT (before Thatcher), gives us the know-how about the quality of materials which should be used. We are a family based business and our Ethos is ‘Make to a Standard – NOT down to a price’. Size: Size is 5.75m x 3.7m (19ft x 12¼ft nominal) Apex Cabin or Gable Style. Note this is the external size of the body of the cabin. The lugs extend 100mm on each corner making the overall size (as most other companies quote) 200m larger. We mention this so you know you are comparing ‘eggs with eggs’. 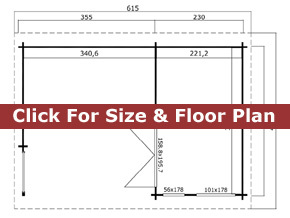 Approximate clear internal size will be approx 5.65m x 3.6m. Please check with us if internal size is crucial. Windows: Two (2) contemporary style joinery quality windows included as standard. Size of outward opening window is 56cm wide x 179cm high (22in x 71in) and double fixed window which is 101cm x 179cm (39¼in x 71in). Complete with easy adjust hinges, silicon gasket seals and delightful silver finish window handles. Supplied untreated as standard. Double glazed as standard NOT single glazed. Lower Walls: Height: 217cm (85½in) – on all Tadworth cabins. 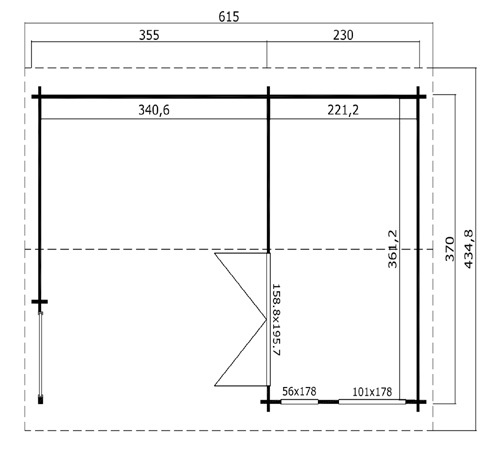 Higher Walls: Planning friendly height of 2514cm – on all Tadworth cabins. Installation: These buildings are supplied in kit form for self erecting. Option for fitting through a third party if required. If being built you would require a concrete base or solid and level paving slab base. Optionally, we have an option for building a base for you. These log cabins are assembled by interlocking the panels for ease of taking it down again if you decide to move. This Tadworth Multi Room Log Cabins is a delightful and stylish apex cabin building with the large covered area for relaxing transforming this building to another level. You have a choice of windows so this cabin will reflect your taste ensuring it will be a proud asset for you and your garden. This Nordic wood cabin is less than 2.5m tall for planning and fully double glazed for comfort.